Up for sale is my harpoon gun by Alex Henry. 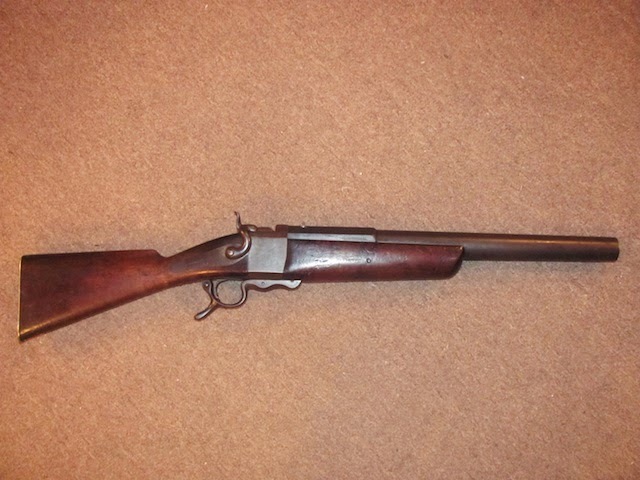 Made in 1874 it is the only one Henry made in this configuration. Built on a 4-bore frame with an extremely heavy barrel it shoots an exploding "bomb". Bore diameter is .880", barrel is 22 inches long and the octagon breech is 2" thick and the round muzzle is 1.6" diameter. Smooth bore. Falling block action. The safety catch on the under lever locks both the hammer and keeps the lever from opening. Original rear sight. With the gun are two brass shells and a deactivated original "bomb". The projectile works thusly: upon ignition (110 grains of black powder) a small lead weight in the nose is released and hits a percussion cap which ignites a fuse. The fuse burns as the projectile is imbedded in the whale's back. The body of the bomb carries two ounces of black powder or 880 grains. This explosion is enough to kill the whale. The guns also shoots 3 1/2" 8-bore ammunition. Unique and one of a kind. 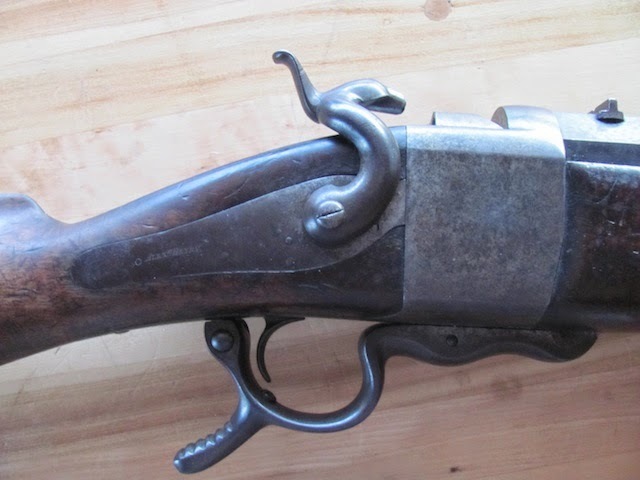 Options are to 1) leave it as is and shoot it, 2) lengthen the chamber to 4-4 1/2 inches to have the world's most powerful 8-bore, 3) rechamber and rebore to 4-bore), 4) leave as is and have a new barrel made in .600, .700, 8 or 4-bore. Price is **SOLD**, and I will consider trades on a small English double rifle in .500 bpe, .577 bpe, .303, .300 flanged, .350 Rigby, .360 no2, or .400-360 and maybe a .333. Best ballistics are with a 1350-grain Paradox bullet with 330 grains of FFg GOEX = 1486 fps and 6600 fpe! Others are a 1000-grain ball and 390 grains FFg and 1620-grain conical and 275 grains FFg. It is great fun. Call or email and we'll talk! Many more photos can be emailed, including the bomb, upon request.